Episode 11: "Baba in Badrinath"
One would think God would have no need to visit holy places. However, Baba in the early years did take devotees on pilgrimages to fulfil His avataric mission: the re-establishment of dharma as promised by Krishna in the Bhagavad Gita. This includes the charging of spiritual batteries in temples and the ancient places of worship. 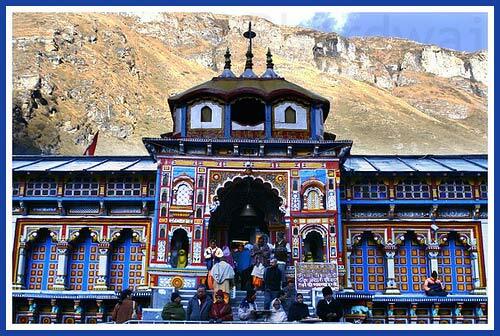 It was 1961 and the destination was Badrinath, the holy site of Vishnu nestled high in the Himalayas. Professor Kasturi, who had been chosen to write Swami’s biography, along with a group of selected devotees, embarked from Madras, now Chennai, on the evening of 7 June. Travelling by train, they expected to arrive in Delhi the next day. Baba would take a morning flight and greet them at the station on their arrival. The train reached Delhi about six hours late and when the hungry, tired and distracted devotees arrived at last, they found Baba shedding cool comfort, consolation and strength with His smile and motherly attention. Baba then described in great detail the sacred shrine to which He was leading the party of devotees, as if He knew every nook and corner of the holy area. He disclosed that Narayana was depicted there as doing penance. No guide book had ever published what Baba related next: that Adi Shankaracharya had brought from Mount Kailash five lingams and installed one each at Badri, Puri, Sringeri, Dwaraka and Chidambaram. Haridwar to Badrinath is a distance of 182 miles. Every inch of the road is saturated with penance and prayer, asceticism and aspiration. Myth, legend and history have woven around every spot stories of sages and saints, of sacrifice and sadhana, of renunciation and rigorous ordeals. The pilgrim is shown places where Shiva, Parvathi, Rama and other Gods did penance, where Parasurama performed purification rites, where Narasimha cooled his ferocity, where Arjuna won his weapons, Karna his prowess, and Narada his Veena, places where Kanva nurtured Shakuntala and Narada received the Ashtakshari. It is a narrow and tortuous road, cut on the face of cliffs, above the roaring waters of the rivers Ganga or Alakananda as they rush down in the ravines below. Baba announced that the rains that often cause landslides would be held off till the party returned to Rishikesh near the foothills. And the clouds obeyed! The line of cars, jeeps, and buses managed to match the coils of the meandering road and at about noon, reached Deva Prayag. Here was the confluence of rivers Bhagirathi and Alakananda. 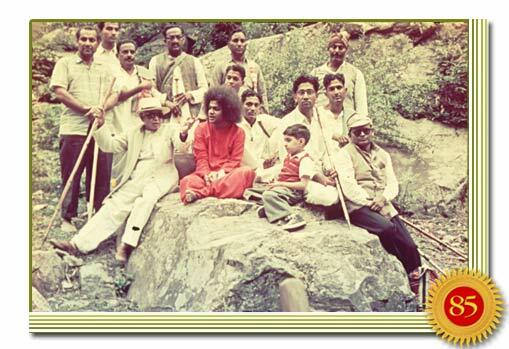 One of the purposes of the tour that Baba had planned was to instil faith in the scriptures – especially those that speak of the sanctity of certain places. He always emphasises that faith in the shastras or scriptural texts is as important as faith in God. So, He directed everyone to have a dip in the sacred waters, before proceeding to Srinagar, the ancient capital of the Rajas of Garhwal. It was there that the party halted for the night. In Srinagar, thousands welcomed Baba. That evening, they presented a programme of Pahadi (mountain) and Tibetan dances. Baba blessed them and gave each of them the unique chance of His darshan. On 13 June, the vehicles moved towards Joshimath where the motor road ends. Baba stopped at Nanda Prayag, and once again directed the devotees to bathe at the confluence of the Alakananda with the Mandakini before proceeding onwards. After Joshimath, they were to travel on foot. Early in the morning on 14 June, with mules and horses laden with luggage, the party started off in high spirits behind Baba who led them along the sacred road. Only 18 miles now separated them from Badrinath. But this was a narrow roadway congested with pilgrims and beasts of burden. That was a sacred path of rubble and stone trodden over the millennia into an uncommon smoothness by millions of pious feet; a path of gasping climbs in the rarefied air, of reeling inclines harbouring dangerous boulders. Beside them, a broad glacier was inching down the valley feeding the Alakananda with its frosty delight; snow-capped peaks cast forever on the horizon filled the devotees with rapture. Snow lay across the pilgrim path while the pilgrims resolutely pulled themselves along on foot, the old and the decrepit with faith as their only stick, some sitting pathetic and forlorn in dandis carried by perspiring hill-men, some swaying helplessly in kandis tied to the backs of men, while some perched on ponies that trot on the perilous edge of the precipice. 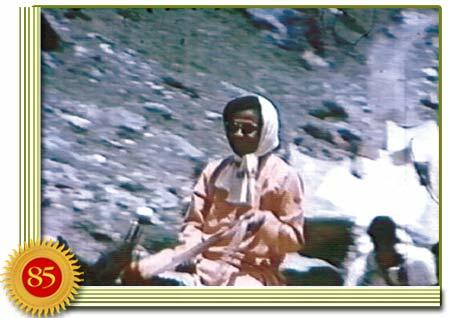 Baba walked the distance of 11 miles to Lam Bagar on the first day and halted there for the night. On 15 June, the remaining distance was covered before noon, in spite of the stiff climb involved. 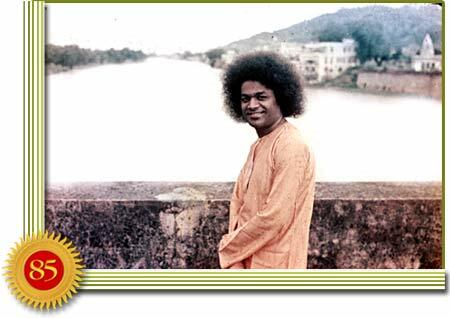 The devotees persuaded Baba to ride a horse but to their great disappointment, He dismounted very soon and resumed the walk. Baba encouraged every one along the arduous path, watching for signs of exhaustion; He directed some to use the dandis, some to mount ponies, some to put a brake on their over-enthusiasm, some to sip a little water and for some, He materialised Vibhuthi. And, this was not merely for members of His party. There were many who sat exhausted on the roadside and Baba walked towards them and revived them with His sweet glance or words and His Vibhuthi. In Badrinath, things were rather quiet on 15 - 16 June, Baba having allowed the devotees to perform the pujas they preferred in the temple. He kept Himself busy with granting interviews to several civil and military officers, and members of the temple committee who had heard of His Divinity and come to receive His darshan. But the following day, 17 June, proved exceptional. Baba selected this date for re-energising the shrine of Badrinath with spiritual power. During the morning abhishekam, that is, giving the deity a ritual bath, Baba who was sitting facing the idol, materialised a beautiful four-armed Narayana. Then, in a trice, He created a golden lotus with a thousand petals, lovely beyond all imagination. Baba waved His hand again and a lingam was in His palm. He placed the lingam in the centre of the lotus, which had been divinely designed to contain it. 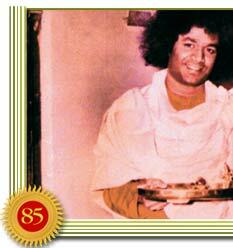 With both idol and lotus on a silver plate, Baba came away to the Dharmasala where the devotees were all staying. Nearly 1200 years ago, Shankarcharya was at this very site with the very same lingam. Shortly before, he had been called by Shiva to Kailash. There Shiva instructed him to continue his mission of reestablishment of dharma and gave him five lingams to install in the temples of his choosing. Badrinath was one of them. 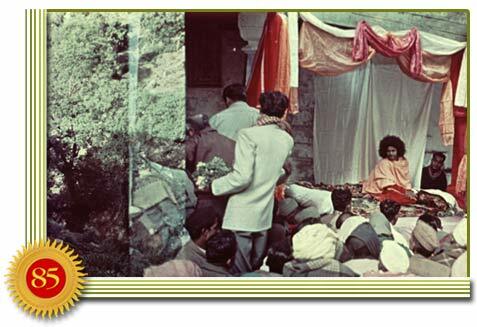 When Shankarcharya arrived in Badrinath, he found the Narayana idol missing and the shrine in ruin. He restored the temple and recovered the idol after divining where it had been thrown by alien hands into the Alakananda River. First, he installed the lingam in a stone niche secreted from the eyes of man. Next, he reinstalled the idol well above it, available to the loving gaze of worshippers and devotees. 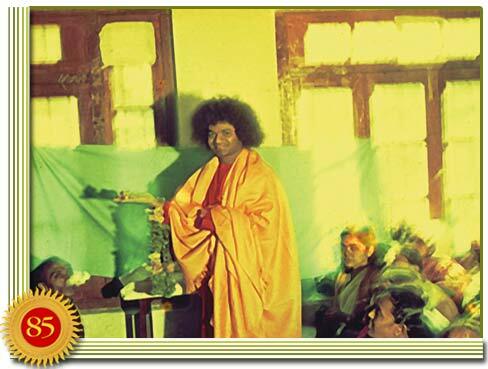 In the Dharmasala, Baba directed the devotees to sing bhajans and while the praise of Narayana was being sung, He rose and said: “Now we shall consecrate the lingam again.” He showed the lingam to everyone, bringing it near each person. 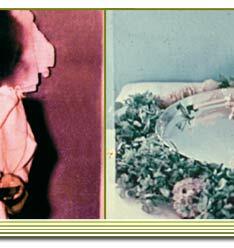 Baba pointed out the translucence of the material and the form of an eye that was mysteriously incorporated inside it. The eye was a black shining retina on a white background with upper and lower lids. When Baba moved the lingam from side to side, the eye seemed to roll in the same direction. He called it a Netra Lingam, ‘netra’ being the Sanskrit for the word ‘eye’. He materialised a silver vessel full of holy water from Gangotri, the source of the Ganges River. 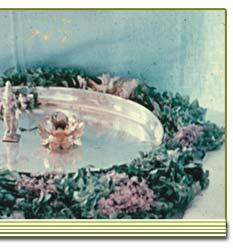 Baba then performed abhishekam, the ritual bath. There was a hole on the bottom of the materialised pot. Baba moved his finger away from it, allowing a stream to fall on the image of Narayana while devotees chanted the Vedas. After abhishekam, a puja, a ritual worship using the petals of flowers, was to follow. For this, Baba materialised 108 bilva leaves made of gold. From His divine hand, the ‘leaves’ sparkled as they showered onto the silver plate. Again the hand waved, but this time flowed forth a marvellous shower of flowers--with the dew on them still fresh. When a spiritual dynamo is set to work at a holy spot, the source of energy - a chakra or a lingam - is planted there deep beyond the sight of man. In times of decline, the energy in these dynamos run down and need recharging. That is the function of avatars and great holy men such as Shankaracharya. The puja was now being performed on behalf of all present by Dr. Ramakrishna Rao, Governor of Uttar Pradesh. The appropriate mantras were chanted by the devotees. Suddenly the lingam disappeared! Baba said he had sent it back to the stone niche whence it had come. The purpose for which it was drawn out had been fulfilled. It had been charged with immense potency. The temple was consecrated anew—this time by the Manifested form Himself. This was in pursuance of Baba’s mission of Dharmasthapana, the revival and re-establishment of the moral order in human affairs of which promotion of faith in the shastras, the Holy Scriptures, and spiritual practices are important. Many years earlier, Seshagiri Rao with other devotees had composed 108 names of Baba for the purpose of worship. When he presented the list for approval, Baba indicated a few were inappropriate. Among these was “Shankara Amsa” meaning a limb of Shankara. By substituting the name, Shankara, without qualification, Baba affirmed identity with Shankara Himself. So it was Shankara who charged the lingam that Lord Shiva Shankara gave and Adi Shankaracharya had installed.